Moscow’s Domodedovo-based S7 Engineering, the maintenance, repair and overhaul (MRO) arm of the S7 Technics Holding, has been accredited with the latest version of the EN 9110:2016 international standard. 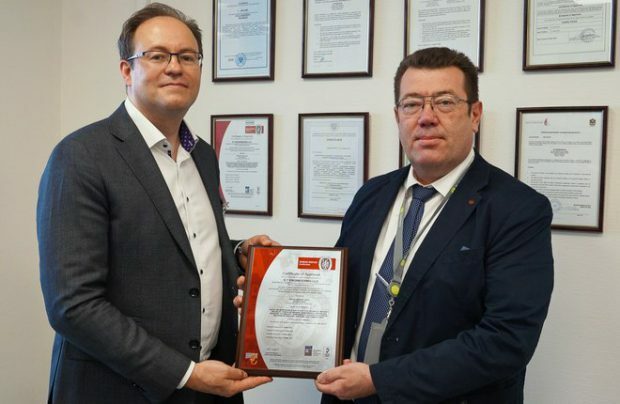 Issued by international certification body Bureau Veritas, S7 is the first among all Russian and CIS MRO organisations to gain the accolade, which verifies S7 Technics’ Moscow division’s compliance with EN 9110:2016 standards which are based on ISO 9001:2015 and outline the benchmarks for quality management systems (QMS) of aircraft maintenance organisations. “A quality management system, which functions in accordance with EN 9110:2016 requirements, helps the company to streamline the way it is run through managing business processes and measuring their performance against a number of indicators, which enable us to identify and eliminate weaknesses,” says Oleg Golomolzin, S7 Engineering’s quality director. “The main indicators are safety, compliance with quality standards, meeting the deadlines and customer satisfaction,” he adds. The advantage of an EN 9110:2016-compliant QMS is the system-minded approach to corporate management of a maintenance organisation, based on a set of rules designed by the International Aerospace Quality Group (IAQG), including best practices not previously covered by EASA Part 145. The fact that S7 Engineering holds and sustains an EN 9110:2016 certificate also sends a clear signal to its customers that they may place their full confidence in the provider’s production capabilities and reliability. “It contributes to strengthening the company’s position in the commercial aircraft maintenance market primarily through the attested safety of its services to airlines and, ultimately, to passengers,” stresses Marat Tereschenko, general director of S7 Engineering. “By implementing EN 9110:2016 standards we are counting on supporting our aircraft maintenance offer and on becoming more attractive for our customers and partners, both in Russia and beyond,” he adds. The motivation for initiating EN 9110:2016 audits for S7 Technics companies was the development of closer cooperation with international partners. In the short-term perspective, the holding’s other MRO divisions – S7 Engineering’s Mineralnye Vody facility and Novosibirsk-based Sibir Technic – will also soon be EN 9110:2016-certified. The introduction of EN 9110:2016 has enabled S7 Engineering to not only improve its QMS, but also to create new opportunities for the seamless integration of a lean production system, thereby securing the continuous improvement of the company’s organisational and production efficiency. “An efficiently functioning QMS – one designed in compliance with international standards and best practices – will help S7 Technics Holding to optimise its production processes, eliminate duplication and non-production losses of resources, ensure the presence of sufficient staff numbers and their individual credentials, as well as maintaining a high quality of supplied materials and equipment,” Evgeny Shipilov, certification director of Bureau Veritas Certification Rus affirms. “Undoubtedly, the order and transparency of business processes provides the necessary fundamentals which facilitate the implementation of state-of-the-art production technologies and the lean production concept at S7 Technics Holding. “Moreover, most lean production instruments are based on statistical quality management methods and Total Quality Management concepts, which lay the ground to all quality management systems,” he adds.